Christopher Prestia began his musical training at the age of six in Garland, Texas, studying piano under Kathy Pratt. After relocating to Wantage, NJ, he discovered his love for the organ when he accepted his first position as a church musician in October of 2004. After starting his first piano students and beginning formal organ lessons with John Baratta in Newton, NJ he decided to make teaching and sacred music his life's work. 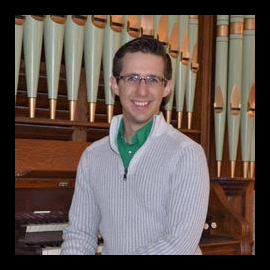 Christopher completed his Bachelor’s degree in Organ Performance with Mark Laubach at Marywood University in Scranton, PA. While at Marywood he also began his vocal and choral studies under Sr. M. Alphonsa Concilio and Dr. Rick Hoffenberg. Christopher continued on to study Organ Performance, Sacred Music, and Choral Conducting at Indiana University under Janette Fishell, Bruce Neswick, and Dominick DiOrio, respectively. Since then his career has taken him to serve parishes in Central Pennsylvania and New York City. Christopher also maintains a studio of private music students, emphasizing skills that can be applied equally to music and everyday life. In his spare time Christopher enjoys architectural design, cycling, wellness, cooking, and learning about the Victorian and Edwardian eras.